Don’t cut your laundry any slack or shy away from cleaning chores. With these empowering tips from CLORALEN®, you’re an instant pro. 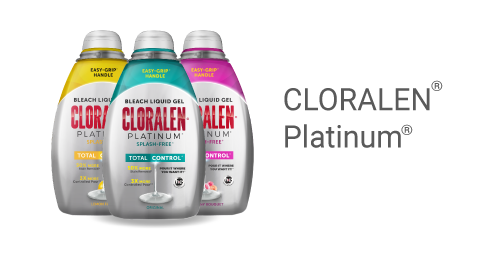 With CLORALEN® TRIPLE ACTION BLEACH, you can even confidently eat barbecue ribs in a white linen suit. We’ll show you how to deal with stains. The stain—not so much. 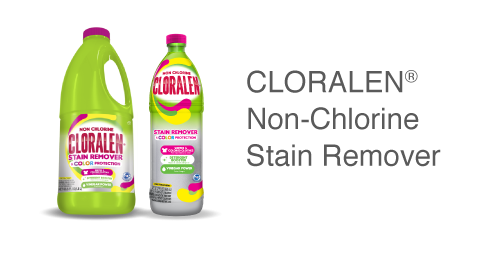 With CLORALEN® NON-CHLORINE STAIN REMOVER, you can safely clean your favorite color fabrics. DEGREASE – Stovetops, vent hoods and cabinets are grease magnets. To degrease, spray CLORALEN® MULTIPURPOSE CLEANER, on the surface, wait five minutes, wipe with a sponge, then rinse with water. DEODORIZE – Like an unwelcomed dinner guest, food odors can linger. Add 1/3 cup (3 fl. oz.) 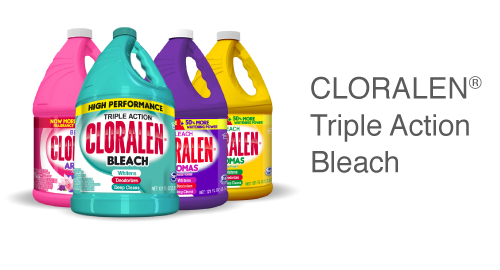 of CLORALEN® TRIPLE ACTION BLEACH in ½ bucket (1 ½ gallon) of water. Apply to sponges, dishtowels, trash cans and even PVC drain pipes. Let it stand for 5 minutes, rinse with water, and smell the freshness. With CLORALEN® Bathroom Cleaner with Bleach, you can easily rid bathroom surfaces of mold, mildew and soap scum.